Chinese companies log fastest growth since 2010 and now hold a 13% share of fabless IC sales. 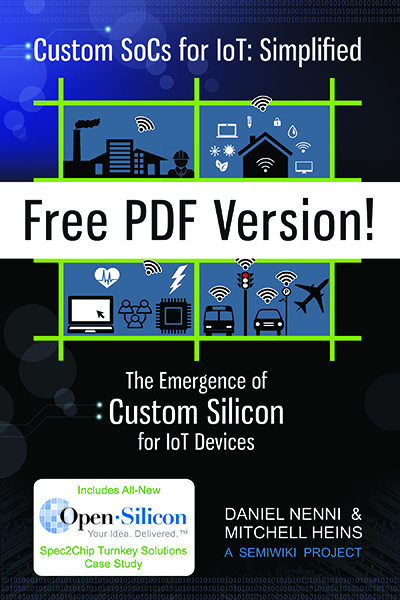 IC Insights published its updated 2019-2023 semiconductor market forecasts and top-40 IDM and top-50 fabless IC company sales rankings in its recently released March Update, the first monthly Update to the 500-page, 2019 edition of The McClean Report—A Complete Analysis and Forecast of the Integrated Circuit Industry. 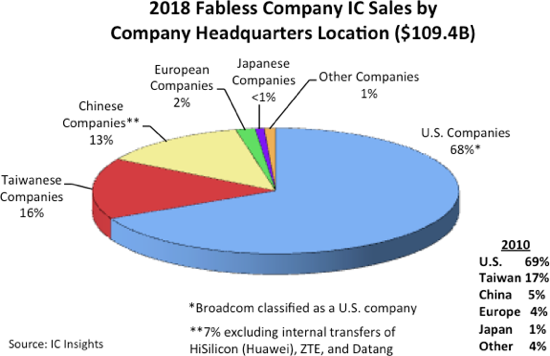 Figure 1 depicts the 2018 fabless company share of IC sales by company headquarters location. With 68%, the U.S. companies continued to hold the dominant share of fabless IC sales last year, just one percentage point less than in 2010. Since 2010, the largest fabless IC marketshare increase has come from the Chinese suppliers, which held a 13% share last year as compared to only 5% in 2010. In 2018, four of the top five fastest growing fabless IC companies (with greater than $200 million in sales) were Chinese companies (BitMain, ISSI, Allwinner, and HiSilicon). However, when excluding the internal transfers of HiSilicon (over 90% of its sales go to its parent company Huawei), ZTE, and Datang, the Chinese share of the fabless company IC sales drops by about half to 7%. There was only one Japanese firm in the 2018 top-50 fabless supplier ranking—Megachips, which saw its sales jump by 19% in 2018 to $760 million. The lone South Korean company—Silicon Works, had a 17% increase in sales last year to $718 million. Worldwide fabless IC sales increased by $8.3 billion in 2018, which represented an 8% increase from 2017. In total, 16 of the top 50-fabless IC suppliers had better results than the global 2018 IC market increase of 14%. 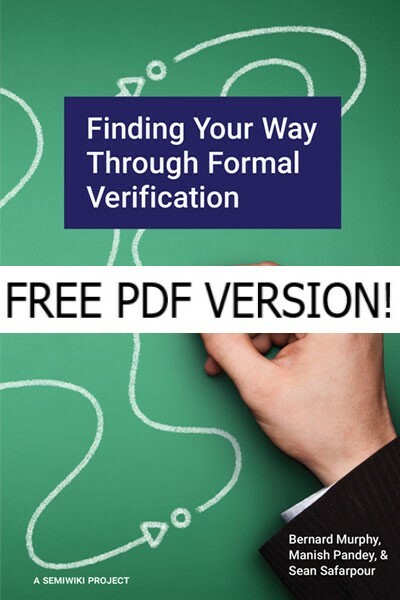 Overall, 21 of the top 50 fabless IC suppliers registered double-digit growth rates last year while five companies logged double-digit declines. Five fabless companies—China-based BitMain, ISSI, Allwinner, and HiSilicon, and U.S.-based Nvidia—registered â‰¥25% growth in 2018. The fastest growing fabless IC supplier in 2018, at 197%, was China-based BitMain, which has had a very interesting past couple of years. It should be noted that labeling BitMain an IC supplier is a bit misleading. BitMain is an electronic system supplier of cryptocurrency mining equipment. Since the company does not sell individual ICs on the open market, its IC “sales” are similar to those IC Insights lists for Apple, with BitMain’s IC sales essentially being the value of ICs it purchases from its sole-source foundry—TSMC. It is estimated that BitMain held an 84% share of the $5.0 billion worldwide cryptocurrency mining equipment market in 2018. The company had a meteoric rise in its sales over the past three years. BitMain’s total sales were $278 million in 2016, $2.5 billion in 2017, and an estimated $4.4 billion in 2018. The company’s equipment sales are very closely tied to the price of cryptocurrencies, especially Bitcoin. With the crash of Bitcoin prices from $18,000 in January 2018 to $3,500 in December 2018, IC Insights estimates BitMain’s total sales went from a company-published $2.8 billion in 1H18 to $1.6 billion in 2H18. 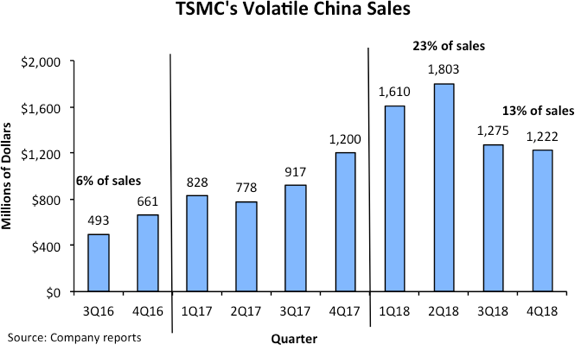 IC Insights believes that BitMain’s steep rise and fall in cryptocurrency mining equipment sales since 2016 is responsible for the majority of the volatility of TSMC’s China-based foundry sales over the past two years (Figure 2). Overall, IC Insights believes that most of the large fabless IC suppliers will continue to do well and will help drive significant sales gains by the major IC foundries (e.g., TSMC, GlobalFoundries, Samsung, UMC, etc.). 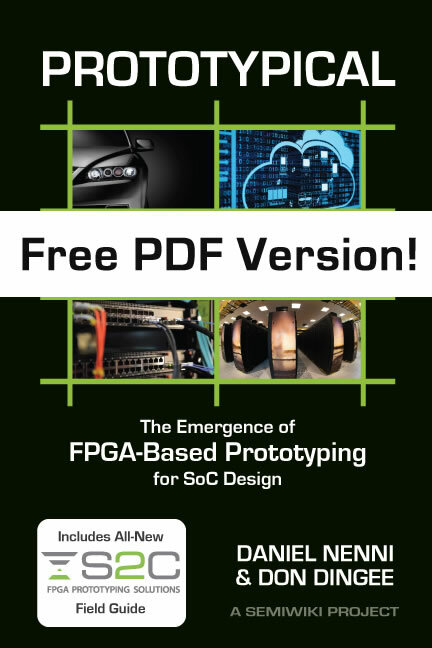 Moreover, as the barriers to entry (i.e., high design costs, increasingly difficult access to venture capital money, etc.) rise, and fewer fabless companies are founded, IC Insights believes that the total fabless IC supplier listing will continue to grow increasingly “top-heavy” in the future.